The Thrilling Adventure Hour announced they will be doing four live shows at Comic-Con. The old-timey, radio-style performance group will have 2 shows on Friday, and 2 on Saturday, at the Horton Grand Theatre (444 4th Ave). Various ticket levels range from $25 to $45, with the late-night performances having access to a VIP party. TAH’s past live performances in LA have included such special guests as Nathan Fillion, Clancy Brown, Karen Gillan, Alan Tudyk, and many other familiar names — so you never know who may show up! For more information and to purchase tickets visit their Event Page. The Balboa Theater (868 4th Ave) is jam-packed with shows during the convention: W00tstock 5.0 on Thursday, Amy Schumer and Bo Burnham on Friday, Chris Hardwick & the Nerdist Podcast Live and Key and Peele on Saturday. See the Balboa’s event calendar for ticket links. Please be aware that a lot of these shows are 18 and up or sometimes 21 and up, so do read all the details before buying tickets. COTF will be hosting events throughout Comic Con at the Chuck Jones Gallery, which is a hop skip and a jump from the convention center. CNET will once again be taking over Lou & Mickeys, and they are actually taking up more of it than they were last year, which was their Basestation theme. Just how much space and what thy are doing, we don’t know yet. The Tin Fish, located between the convention center and the Hard Rock Hotel is being taken over completely, likely by NBC again. Last year, the Tin Fish was the site of the GRIMM walkthrough and the Revolution ferris wheel. The WIREDCafe will be happening again, however rumor has it that it will be toned down some for this year. Hopefully they still have another Reader Day like last year! 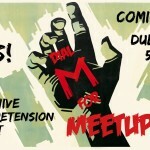 The Battleship Pretension website will have a free meetup on Thursday, 7/18, at Dublin Square (554 4th Ave.). Remember to check out our Event List for a day-by-day list of outside events!